Max Power admits he is looking over his shoulder after Lee Evans made a scoring return to the Latics side on Tuesday night. Evans scored from the penalty spot in the Checkatrade Trophy win against Middlesbrough under-21s on his return from a three-match ban for his red card against Scunthorpe. And while Power watched from the stands, his thoughts turned to keeping his place in Paul Cook’s side. “Competition for places is healthy, I was pushing Lee (Evans) and Sam (Morsy) up the side, and everyone is pushing each other,” he said. “So with anyone who comes into the side, we’re a team full of good players, so if you find yourself out of the side, you know a good player is coming in to replace you. Blackburn Rovers arrive at the DW Stadium on Saturday looking to keep their position in the play-off places by building on last week’s 3-0 win over Portsmouth. 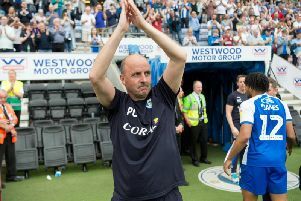 But Latics have their own ambitions to take care of, including pushing Shrewsbury Town for pole position in League One and preserving their proud home record this term. And Power is refusing to let the spice of the rivalry between the sides cloud his focus. “It’s a derby, another game without putting too much emphasis on it,” he said. “We go out to win every game, with it being a derby, it makes no odds, our mindset is still the same. Power was also pleased to see a clutch of youngsters put in eye-catching performances in Tuesday night’s win, which lifted Latics to the top of Group B in the competition. And the midfielder noted it preserved Wigan’s home run, not just in the league. “We’ve done really well at home, and our home record at the DW at the moment is brilliant,” he said. With a small, but strong squad, Power also thinks the Checkatrade Trophy can help managers pick out future stars.